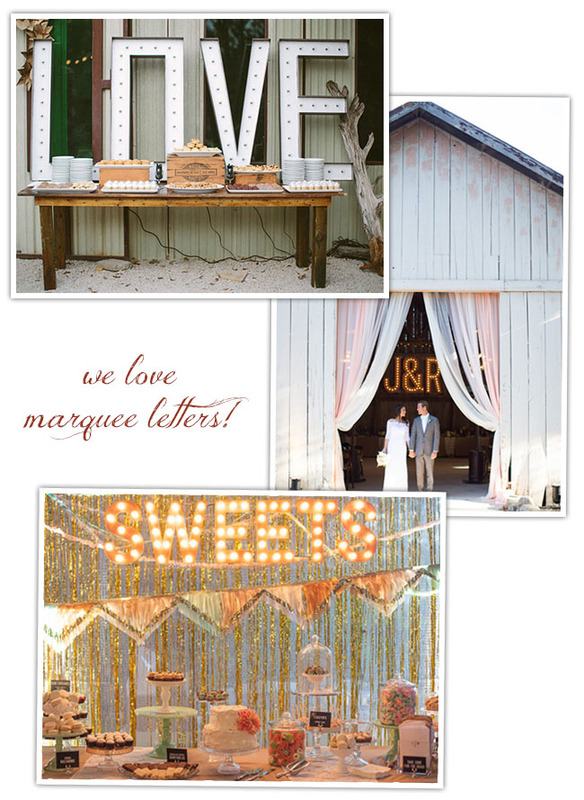 Here are GWS, we love using giant letters for your wedding day decor! One of the most popular styles are marquee letters. 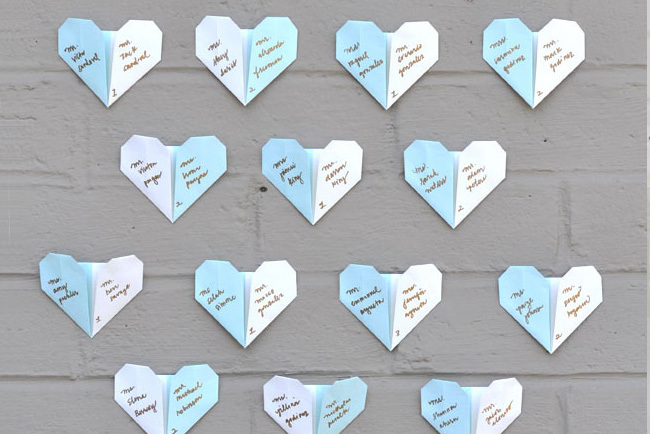 It can be a bit hard to find the perfect letters or words you want to spell out, but our DIY contributors Smitten on Paper are here to show you that it is actually pretty easy to create these yourself! Step 1: Map out where you would like the bulbs to be. We placed our bulbs 1 inch in from the outside of the letters edge and 2.5 inches apart. 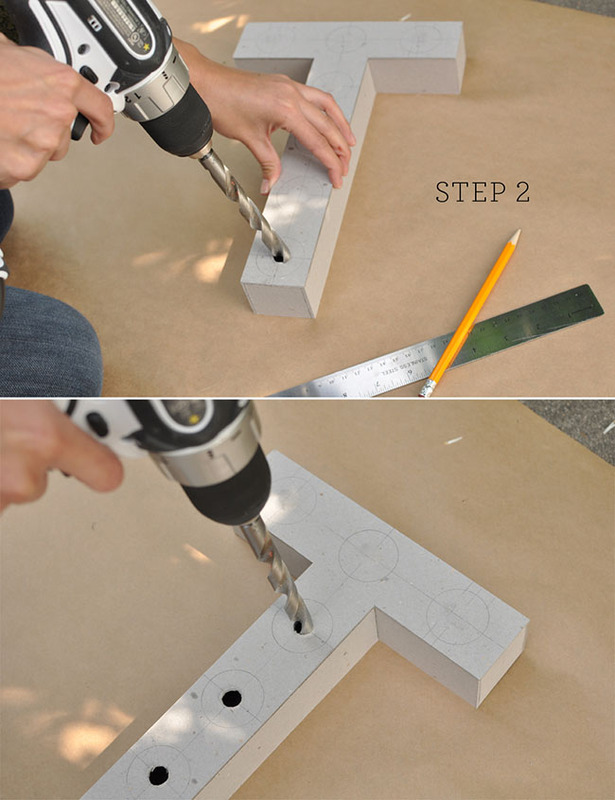 Step 2: Use a large drill bit to drill into the letter. 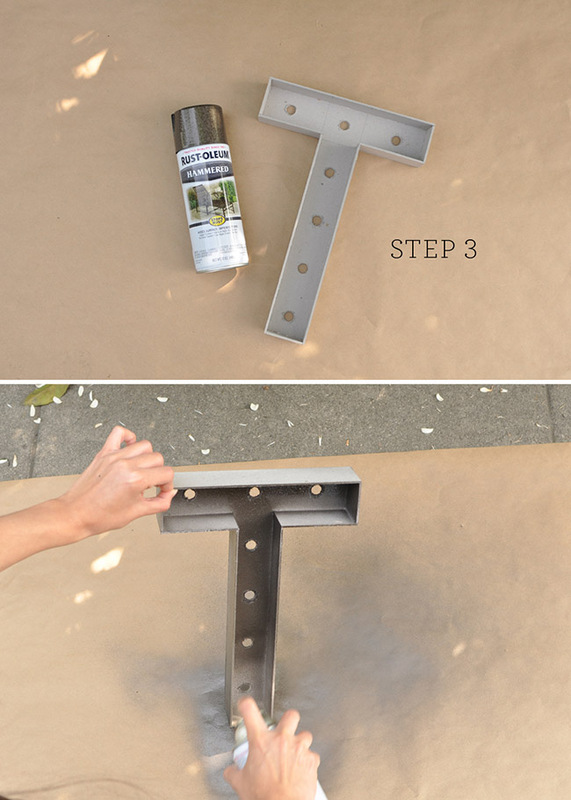 Step 3: This is optional, but you can use spray paint to give your letter a certain look. It just depends on what style you’re going for. Step 4: Install your bulbs! This is the most exciting part! There really is no easy way to hide the extra wires so you will just need to tuck them away. 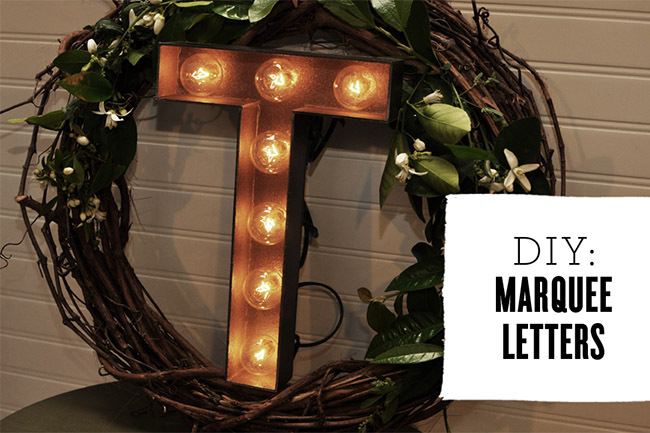 We placed our marquee letter within a wreath which would be a perfect centerpiece for someone’s big day! And below are a few other fun ways we’ve seen them used in weddings! And the best part – you could hang the sign in your home after the wedding. :) How would you use marquee letters? I love these letters. They look absolutely FANTASTIC in photos! 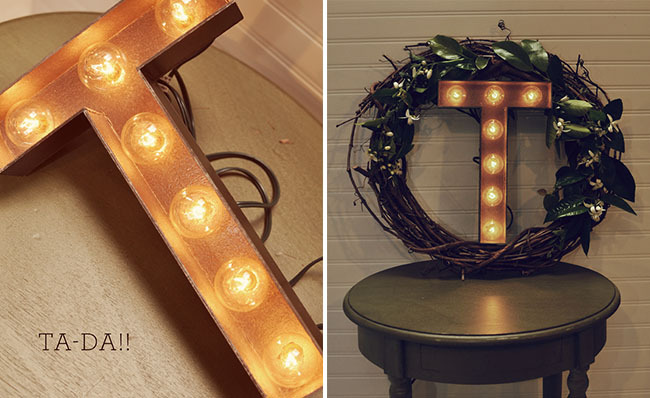 These look great and I’d like to make some for my wedding in June, the only thing perpelxing me is if you buy the paper mache letters and turn them around (so that the lights sit in the hollow part) then the letters will be back to front…!? Here’s a behind the scenes secret, we actually had to make our own letter because JoAnn’s was out at the time! 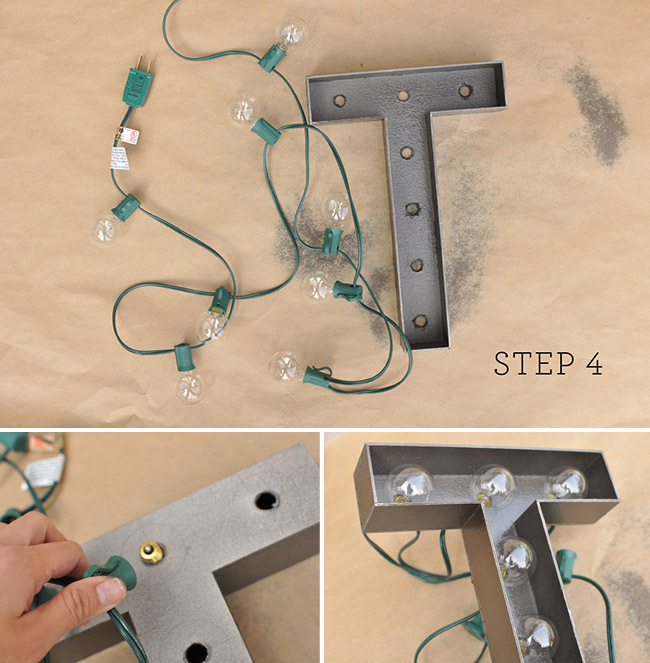 But if you do buy the letter from JoAnn’s, just use an x-acto knife to cut the front off the letter so that the lights will sit in the hollow part and still be the front. Hello! I love this idea and actually picked up letters at Jo-Ann’s today. However, the letters there are not open on the front side. Did you cut the front of the letters off so they were open to house the bulbs? If so, any tips for doing that? Here’s a behind the scenes secret, we actually had to make our own letter because JoAnn’s was out at the time! 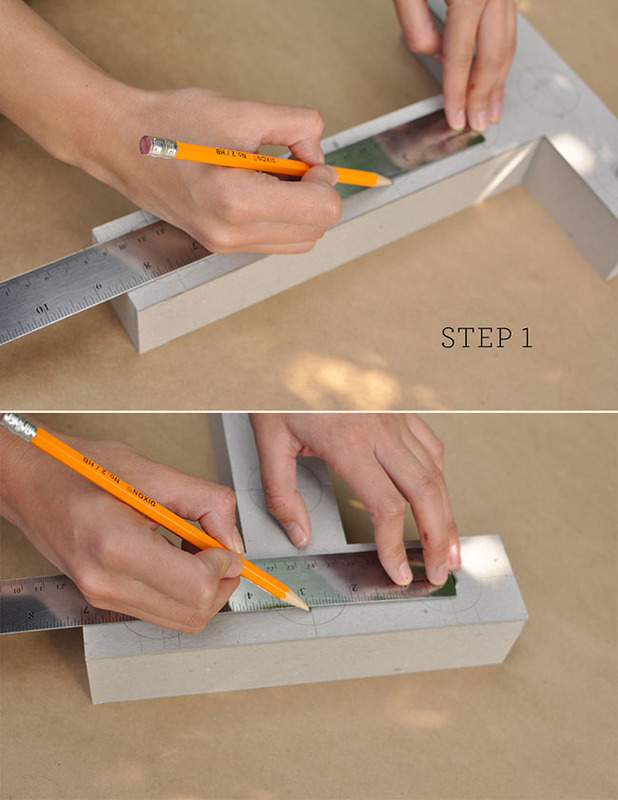 But if you do buy the letter from JoAnn’s, just use an x-acto knife to cut along the edges of the letter. It should be pretty easy! Hope this helped! Terri, thank you so much! I’m excited to try this out and will probably end up posting pictures of the whole process (with finished product) on my blog. I absolutely love this idea and would love to make it for my wedding! My only question is I can only find globe string lights that come with 25 bulbs. Most of the letters in your post have 8 or so bulbs in each, how do you use the 25 globe strings for those? Do you just use the globes you need for each letter than somehow hide any left per globes at the back? Have y’all ever had any issues with the bulbs getting too hot for the paper mache letters? I don’t want it to become a fire hazzard in my house? Question…. how did you have only 7 light bulbs in your letter? The target lights are 25ct and I’m wondering how to adjust them or if I should shop and see if I can find a lower bulb count for the string of lights. I have paper marquee letters for our Wedding. Just curious what the exact spray paint you used was. It is exactly the look I’m going for!